Radeon Omega Catalyst Drivers will provide gamers with an alternate set of drivers, ones that have more options and features than the original sets. The drivers contain optimizations, extra features (like OC capabilities), more resolutions and internal tweaks that can give them the edge in a gaming enviroment over the normal drivers, which are often tailored for synthetic benchmarks. All Omega driver sets are tested to ensure maximum compatibility and reliability. Don't know what the fuss is about? Best driver for ATI Cards! No mobility or hardware vendor limitation! This driver installs with all! including mobility Radeon cards of all vendors unlike ATi Drivers which check for OEM hardware and prohibit driver installation. Best of all this driver comes with the normal control panel without slow CCC!! Omega drivers are nothing special. Not faster, and certainly not nicer. Besides, I have an AGP X1950GT and it runs perfectly with the official 7.10 drivers (smartGart enabled). Don't know what the fuss is about. if u have a dual core system, with only an AGP slot... BUY a new MOBO, trust me i bought one of those new DX10 AGP cards... NO driver support from any company... PCI-E here i come! These dont work with an X1950Pro, it has the same smartgart problems at the offical ATI drivers. quit whining vista users, i'm happy with my XP! Btw -Lord-, did you tried to use the new DriverHeaven's ModTool.NET 0.8.0.0? The IGP 9000 is supported the so you will able to use Vista on you lappie. But only for XPDM drivers since AFAIK IGP9000 supports only PS 1.4 and up to 64 or 128 MB framebuffer. So it has no sense to buy something better then Vista Home Basic. the omega drivers are the bomb, I must admit. But, just like the official ATI drivers, there is no new support for the Radeon 9000's, more specifically the 9000 IGP for laptops. This single item prevents me from being able to use Vista on my 3.46 GHz laptop and that's a major disappointment. 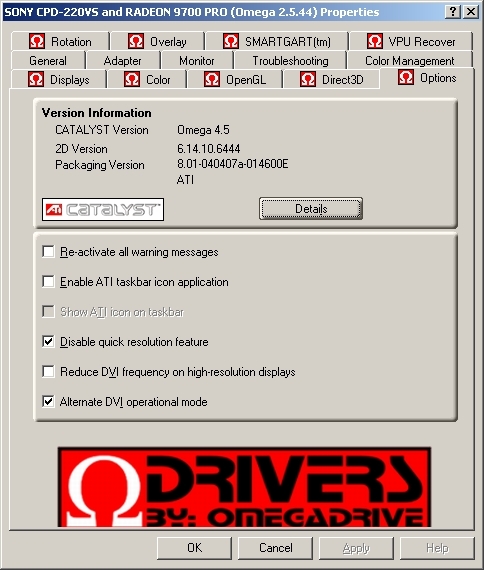 The older legacy version of Omega tools were my saving grace for getting my ATI Radeon Mobility 7500 to run on Windows Vista with dual screen support with a 22" 1680x1050 screen. I tried many other options, but this worked best. The drivers are great. I would love though for someone to focus on creating wrappers for non-Vista certified video cards to support Aero even if it's slow. I had an intresting situation with my new X850 XT card and latest Omega Drivers. Drivers installed correctly and worked fine. I played latest games with graphic options tuned high without problems. But suddenly after 1-2 day uptime, Direct3D games failed to start. Only thing i get was black screen. So i had push the reset button. Same thing happened two days later. And two more days later, same annoying black screen. It was weird to because after the reset, everything was back to normal, but day or two later i was experiencing this. So switched back to original ATI's drivers and guess what, no black screens after two days. I can keep playing without having reboot my machine. So i guess this teached me that unofficial drivers doesn't always provide best solution.